There's a lot of conversation in church circles of "missional" churches. I am one who finds the writings and the experiments with the emerging and missional churches quite fascinating and hopeful. I've come across quite a few attempts at to define what it means to be a missional church. Bottom line, if a church is missional, I believe there are several characteristics about this church. The mission of the church is not to be discovered. God has already given to the church her mission. It is the great commission: "Go and make disciples of all nations, baptizing them in the name of the Father and of the Son and of the Holy Spirit, and teach them to obey everything I have commanded you." In order to be a missional church, it needs to be filled with missional disciples. 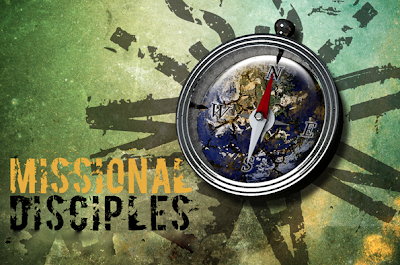 So what is a missional disciple? A missional disciple is one who has made the mission of Christ his/her own mission and see themselves as a missionary in a world that needs to know who Christ is. 1 Peter 3:15 says, "Always be prepared to give an answer to everyone who asks you to give the reason for the hope that you have." The Bible assumes that when we live as faithful disciples, that our lives would be so distinct, set apart, and attractive that the people around us would ask us about the hope that is in us. So let me ask you, when's the last time anyone asked you about the hope that is in you? When's the last time anyone asked your church about the hope that your church brings? How can we live in such a way that people would ask? You've got be missional disciples. Whatever else this may mean, it has to mean that the missional disciple see him/herself as a missionary in the world they live. In order to be a successful missionary, here are several things that successful missionaries must do. They need to learn the language of the people they are trying to reach. If you don't know the language of the people you're trying to reach, you're not going to get anywhere. We must learn the language of the people in our neighborhoods hanging out at Starbucks, at the gyms, at the bars, at our work places. They need to learn the culture of the people they are trying to reach. Even if you know the language of the people you're trying to reach, you still need to learn the ethos and the values of the people you're trying to reach. Because until you do, you will find yourself offending the very people you're trying to reach, and you won't even know that you're being offensive. They need to certain of Jesus. You need to know what the good news is. You need to know why you're doing what you're doing. They need to translate the good news of Jesus Christ in a language and values that makes sense to the people they are trying to reach. They need to know how to be good news to the people they are trying to reach. This is what successful missionaries do. This is what missional disciples do. Missional churches, therefore, are churches that are making and equipping missional disciples. Ephesians 4:11-12 says, "So Christ himself gave the apostles, the prophets, the evangelists, the pastors, and teachers to equip his people for works of service, so that the body of Christ may be built up." The leaders of missional churches will focus their time and energy in making and equipping missional disciples. This is one of the main purposes of leaders in missional congregations. Is that how your church is functioning?